The Indonesian partner of Histori Bersama is Roodebrug Soerabaia, which was founded in 2010 by Ady Setyawan. The organization is named after the red bridge that played a vital role in the Battle of Surabaya in 1945. As a foundation Roodebrug Soerabaia aims to inspire the younger generation to learn more about history. Organizing events such as film screenings, discussions, exhibitions, reenactments, commemorations, historical walks, interview sessions with veterans or witnesses etc. Because Ady Setyawan and Marjolein van Pagee have been working together since 2010 (among others in doing research, translating articles and organizing events) we decided to create this partnership. Our hope is that we can keep working together in the future, exchanging more information and stories! “I admire Marjolein’s idea to connect Dutch and Indonesian perspectives on history. It is commonly known that there is a language barrier, which makes it very difficult to exchange views and information across country borders: only a few Indonesians can speak Dutch and I think it’s the same in the Netherlands, not many Dutch people speak Indonesian. Through this platform Indonesians can follow what Dutch media write about colonial history and it provides the same opportunity for Dutch people who are curious about Indonesian writings on the colonial period. 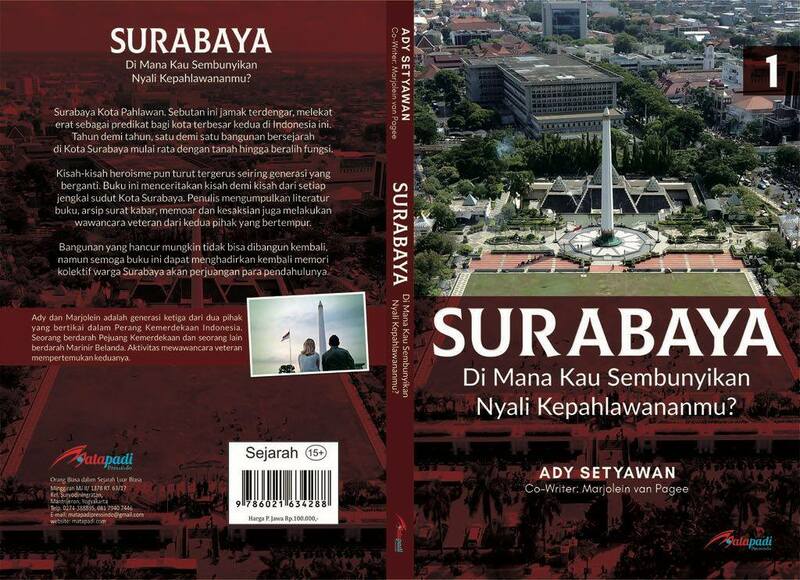 On August 19, 2018 Ady Setyawan launches his second book, entitled “Surabaya Di Mana Kau Sembunyikan Nyali Kepahlawananmu?” (Surabaya, where are you hiding your herosim?) Most of the chapters deal with the history of Surabaya in particular, yet Ady also describes his experience when he traveled to the Netherlands in 2013 and had the chance to interview Dutch veterans. Marjolein wrote one chapter as well, in which she explains about the historical meaning of the Round Table Conference in 1949 and the continuation of Dutch colonialism afterwards. Including the reason why the Netherlands still does not acknowledge 1945 as the date that Indonesia became independent. The book is published by Matapadi in Yogyakarta.